There have been many highlights for Upstate medical student Simone Arvisais-Anhalt, but at the top is how her Rural Medicine preceptor introduced her to his patients in Plattsburgh. Simone, who’s from Plattsburgh in northern New York, served her Rural Medicine clerkships in her hometown for her third year of medical school. Simone’s preceptor, Steven Heintz, MD, is a Plattsburgh native and “a great role model,” she said. Simone recalled one patient with a developmental disability who came in with his mother and a care provider. Dr. Heintz learned that the boy liked pigs, and told the patient how great he thought that was. He even wrote it in his patient notes. “It’s that attention to detail,” Simone said. That, and more than a touch of Plattsburgh pride. “He’d introduce me to patients and say, ‘She’s one of us!’” Simone said. Because of that, patients were very receptive to her role as a medical student in training. Simone said her experience in the Rural Medicine program (RMED) reflected the personal and compassionate nature of small-town and rural medicine. If a resident became ill or was injured, the community mobilized, she said. 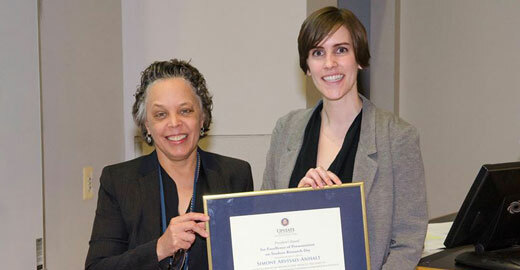 At Student Research Day 2016, Simone received the inaugural President’s Award for her research project, a cross-sectional study of patients visiting free clinics in Syracuse. The President’s Award, in honor of Upstate president Danielle Laraque-Arena, MD, is given to a student in the poster presentation category whose research reflects civic engagement, interprofessional education, inclusiveness, innovation and fairness. Dr. Arvisais-Anhalt graduated in 2017 and matched into the Pathology Residency Program at University of Texas Southwestern Medical Center in Dallas, TX.